on a comforter for our bedroom. Our furniture is brown with black trim and sort of Asain inspired. We'd like to get something that would go with a "China Room" theme, since we have lots of decorations for just that (from when I went to China). These are just six that we have found so far. We are going to keep looking but help us narrow it down a little bit. Let us know what you think. 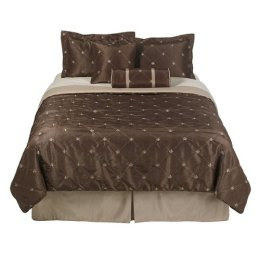 Option #1 from Linens n Things. My choices are #1 and #4. Wouldn't the oranges you picked out clash with your China decorations. The darker browns look more homey to me and I would be afraid of the upkeep on the lighter colors (white). My vote goes to option #1. It is asian looking, but versatile if you ever want to change. Plus, it will go with whatever wall color you select (go red). I like option #3 and then option #1. 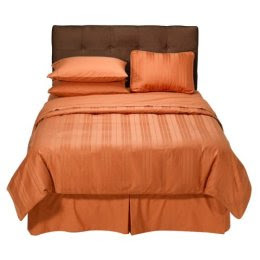 I love the orange hue in #3 and i think it would be a great accent to the rest of the furniture. what color are the walls?